We have put a lot of the blame for high-risk feeder cattle on the cow-calf producer. However, Falkner says it is the system, not the producer, that is to blame. 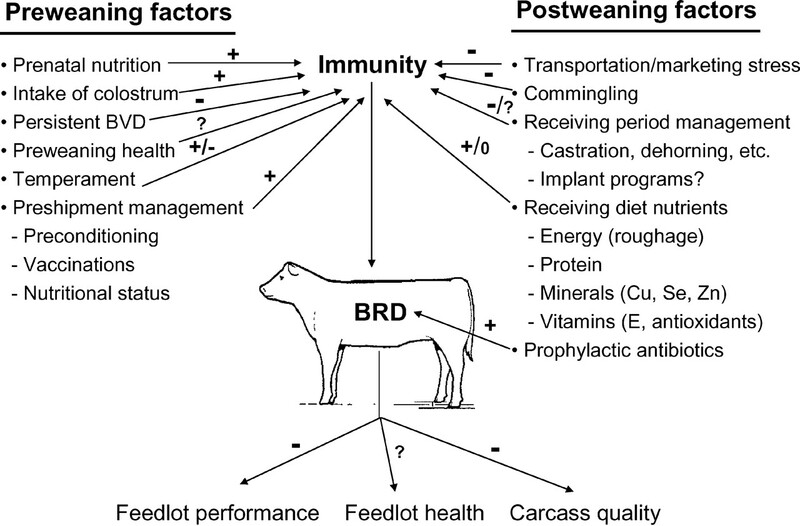 Pre- and postweaning factors affecting bovine respiratory disease (BRD) in beef cattle and the resulting outcomes of the disease. + = decreased incidence or consequence; − = increased incidence or consequence; ? = effects not fully understood based on the available data. 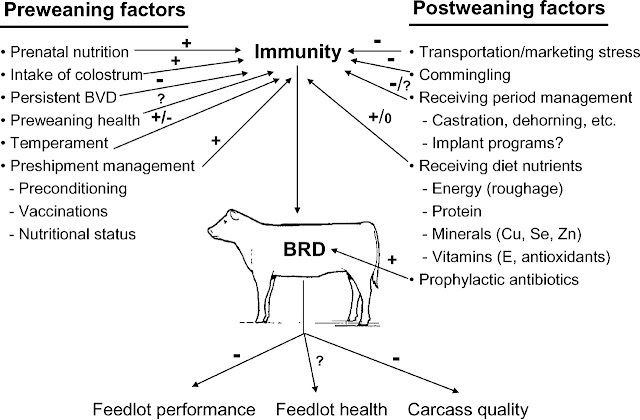 BVD = bovine viral diarrhea virus. Figure 1 from Duff & Galyean (2007) Journal of Animal Science, 85(3), 823-840. Falkner described how as his time since graduating veterinary school has passed, that he knows less but understands more. When talking to Falkner, people want a recipe. He provides two recipes, one for Possumneck pudding and Biscuit pudding. We spend a lot of time chasing the right "recipe" for cattle health. What we need to do is become better cooks. But even more important than being a good cook, is knowing how to run a restaurant. What is your business model? How can you meet your objective better? Question: "If wages come from labor/work, interest comes from savings, and rent comes from real estate... from where does profit come?" The answer is that profits come from risk. Risk and opportunity are synonymous. Unmanaged risks put you out of business. Managed risks provide opportunities for profit. You own land. Land ownership is what drives the industry. In the United States, 60% of our cattle are born in February, March and April. Calf prices are lowest in the fall because of this. What is your business model? Where do you want your business to be in 5, 10, 25 years? Falkner said, "The biggest obstacle standing in our way is 'That is how we have always done it.'" Market access is going to be an issue moving forward. Look at the chicken, pig, and dairy industries for evidence of this. We don't a beef packer; we have global protein companies. Coming on January 1, 2019 there will be mandatory BQA to sell to Tyson. Also coming on that data, South Korea will use "block chain" technology to track the entire history of cattle. Tyson has leased Progressive Beef. Falkner describes an operation in Illinois that feeds cattle. They were dealing with heel warts. They were going to loose market access because too many of their cattle were limping. "Technology is neither good nor bad; neither is it neutral." As business schools studied innovators and early adopters, they looked at the use of hybrid seed in agriculture. In 1957, they published Roger's Bell Curve. Only Innovators and Early Adopters survived. Falkner talked about his great-grandfather being the first to own plow technology in his county. He was an early adopter. Falkner talked about his grandfather buying a tractor. But, he bought a tractor 10 years too late and bought a tractor that did not have advanced technology. The grandfather didn't follow the tradition of the great-grandfather of being an early adopter. You don't need to do what your grandfather did, you need to do things in the same spirit as your grandfather. What are the disruptive technologies in beef production? Technology that makes you more efficient is ruthless. That land that goes for sale, you may not be able to buy it because your more technology driven, efficient neighbor is the one who buys it. Example, you can either sell extra gain from using an implant program or get a premium for selling calves that have not been implanted, but you can't be neutral. If you don't do either (use implants or differential market as no-implant), you will loose out. Lots of people vaccinate their cows. Why should you vaccinate your calves? One is for financial, you can get paid more for vaccinated calves. The other is a moral reason; you shouldn't send out calves that are at higher risk for disease and death. We are at a fork in the road between agribusiness and agriculture. Agribusiness is focused on profit and efficiency. It is about being in the top 25% of profitability. Agriculture is about culture, about a way a life. Commercial beef producers will get more traits and selection index tools in the upgraded Igenity® Beef profile. The Igenity Beef Profile will offer 16 traits for $29, replacing Neogen’s 13-trait Igenity Gold ($40) and 6-trait Igenity Silver ($25) tests. The upgrade includes new predictions for weaning weight, yearling weight and hot carcass weight for a total of 16 traits scored on a 1–10 scale, plus two new selection indexes. “Our customers will be getting a powerful new profile at even greater value,” said Dr. Stewart Bauck, vice president of agrigenomics at Neogen. “The Igenity profile was designed and validated for crossbred or straightbred cattle with backgrounds of Angus, Red Angus, Simmental, Hereford, Limousin and Gelbvieh. What does it mean to have a successful cow herd in the Ozarks? What should be the genetic focus? How do we select and manage cattle to perform on toxic endophyte-infected fescue? What technologies can be used profitably? What marketing opportunities could add value to the cattle? These are questions facing every beef operation in Southwest Missouri, including the University of Missouri Southwest Research Center. As the Center moves away from a focus on grazing dairy production, faculty and staff at the Southwest Research Center and on campus at the University of Missouri recognize there is now an opportunity to increase the emphasis placed on beef cattle Research and Extension at the Southwest Research Center. With support from the Southwest Research Center Advisory Board and key stakeholders in the regional and national beef industry, an effort to expand and improve the Southwest Research Center beef herd is now underway. A Steak in Genomics™ by Jared E. Decker is licensed under a Creative Commons Attribution-NoDerivatives 4.0 International License.